Rolling Hills Middle School graduate Blake Fabian honored as final Student of the Month for the school year. 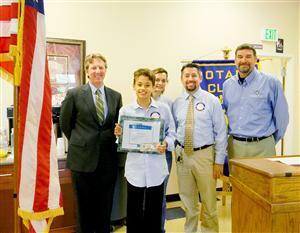 Tenacious best describes the Rotary Club of El Dorado Hills latest Student of the Month, according to Rolling Hills Middle School Assistant Principal Dustin Haley. Now graduated eighth-grader Blake Fabian won the schools "Tenacity Award," Haley noted. "He has come so far," the educator said at Wednesday's Rotary meeting, "and has become such a fine young man." Blake, who will attend Oak Ridge High School next year, participated in the middle school's drama productions and worked on the school paper. He's an "extraordinary" young man, Haley said, and though the staff and teachers are happy he's moving on they're sad to see him go. Blake was joined by his proud mother Sarah Fabian. He received a plaque and a $50 gift from Rotary Club President Jeff England at the breakfast event.